Dark Humor – Set in a modern corporate dystopia – THX1138 and Brazil meets Blade Runner – Players choose a balance of stealth and/or combat to explore the world and collect resources required to progress further. Only 1 weapon and 1 ability can be equipped at any time. Player can move safely through world as long as they don’t violate any laws (being “scanned” in possession of any items/weapons). 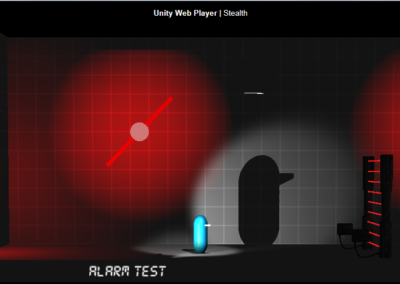 In an alarm state, the environment and enemies move to attack the player until the alarm abates or the player dies. 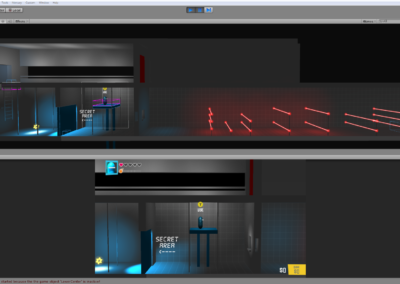 As the level designer on a small team of 4, consisting of 2 developers and a UX designer, I was responsible for implementing all levels and play interactions. The majority of my time was dedicated to building prototypes, levels, publishing builds, coordinating and observing playtest sessions, and incorporating changes to design based on playtest feedback. Play must support 1- 4 players and incorporate stealth-based action as well as weapon-based combat. 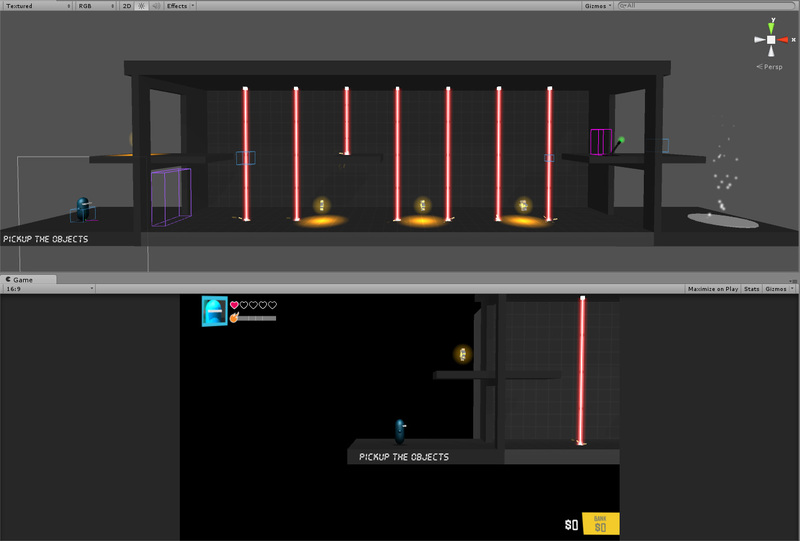 Starting from scratch in Unity, we would also have to balance design development with basic, foundational work like player controls, save states, etc. Highly iterative, observed play sessions and web published builds with write-in feedback provided a tight, continuous, feedback loop throughout the project. Testers included team members, studio members, and employees outside of our group. Our cabal produced builds in “phases” based on design goals and play test feedback. 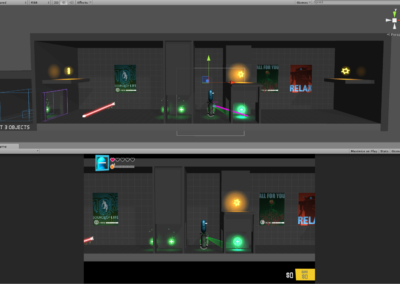 Each phase built upon the previous play test results, learnings and our design goals. Many small, isolated prototypes to be play tested and evaluated for “fun” factor. 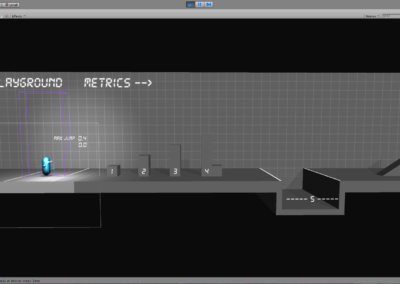 Those that passed would be used in our short “first playable” build. 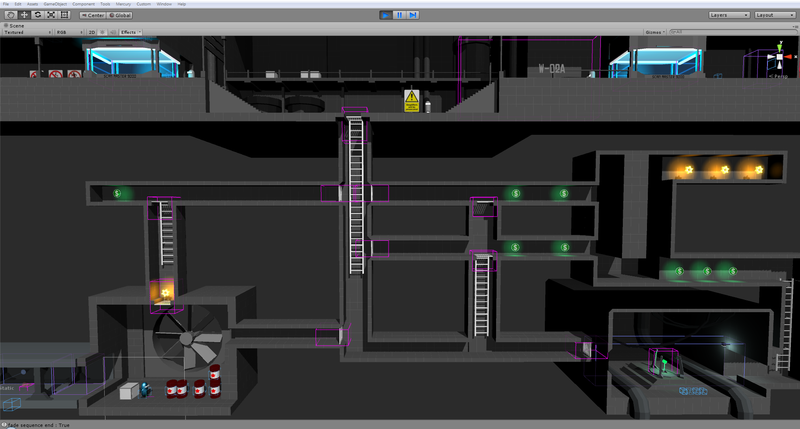 Team generated ideas focussed on player movement and control, environmental threats, puzzles, and alarm/scanner systems. High risk vs reward play. Requires good controls and advanced player skill. 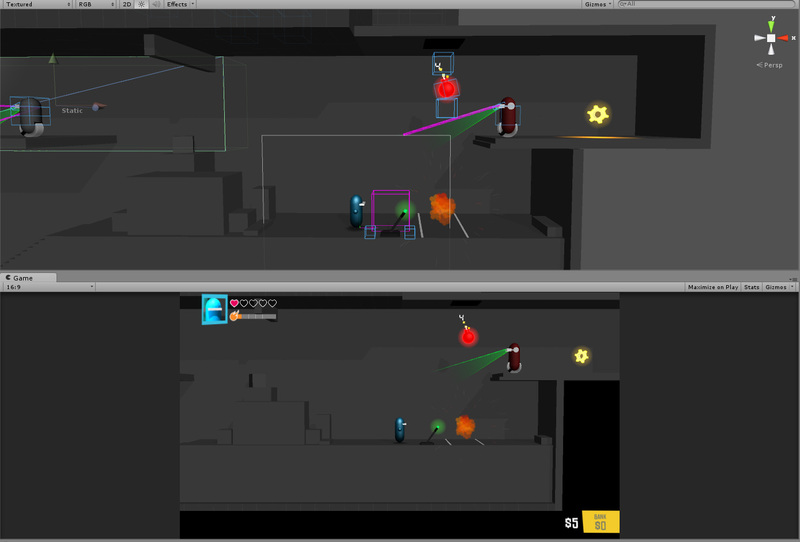 Moving platform shields player from lasers. “Air” lift on right. Disable lasers and ride to other side. 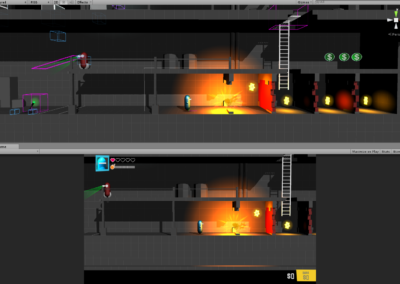 Environmental puzzles and navigation using AI. Physics based bombs can be pushed or stacked to launch other objects, including other bombs! Player feedback, threat assessment, cool down duration. 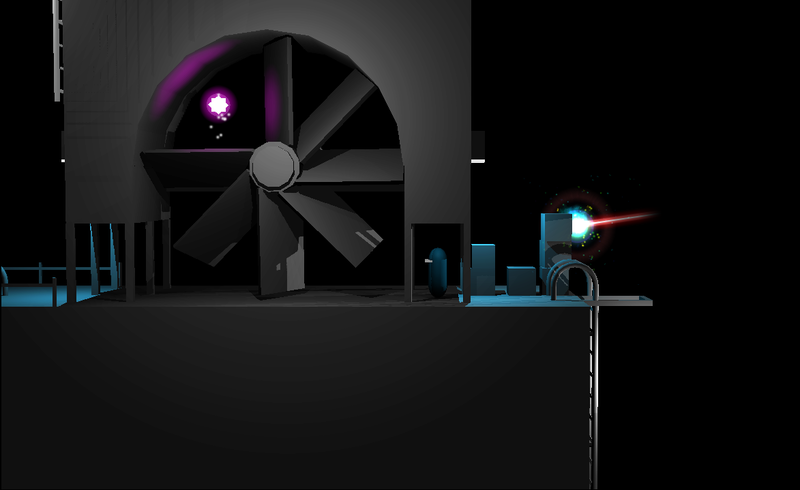 A switch can alter a fan’s direction, allowing the player to pass one way or the other. Retest lasers with adjusted controls. Until then, limit their use. 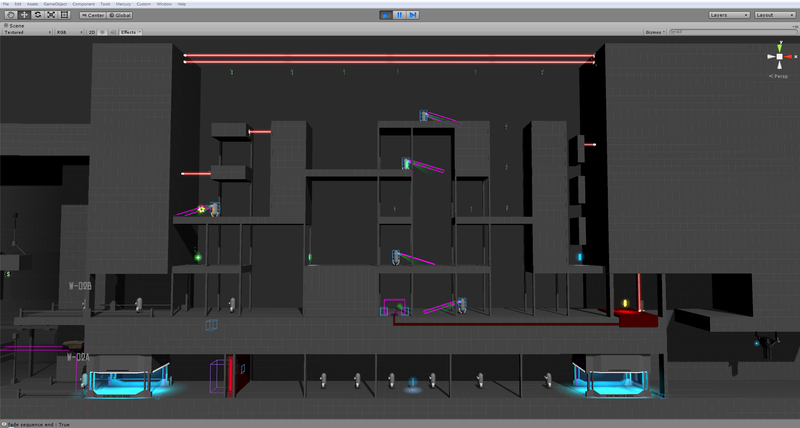 Goal: High experiential density, high action with or without a weapon, include basic pickups and 2 enemy types. Set in outdoor environment and emphasize vertical and 3D level design elements. 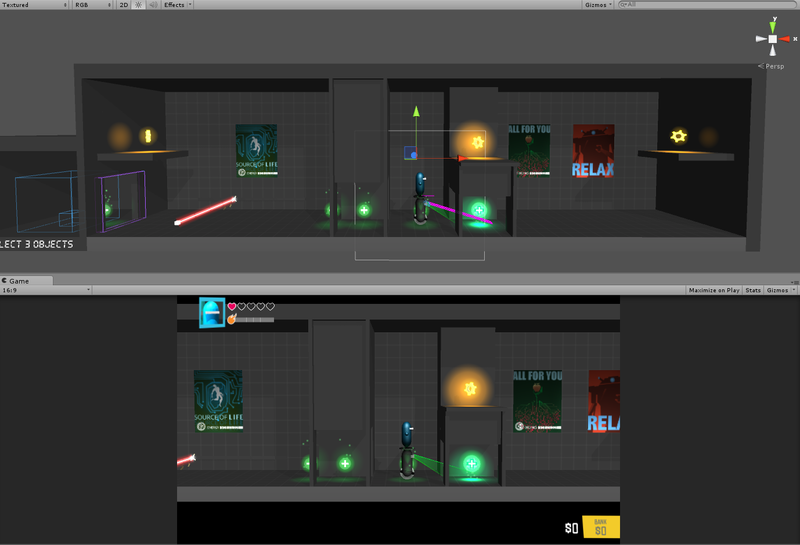 Initial play tests were conducted with no weapons and with different player physics (higher jumping). This footage shows an early pass with a pistol, which wasn’t completely configured to break objects or damage turrets. This was one of the first examples of how much adding even a simple weapon could dramatically alter a level’s design. While not the player’s view, observing play from the layout view proved useful for seeing how and where AI and puzzle elements arranged themselves over time.This helped stimulate more play ideas as well as see where problems could occur. This approach also seemed to keep the player thinking each time they moved through an area, instead of having all of the play triggered by the player. Scripted events were only used when timing was critical to a puzzle or play scenario. 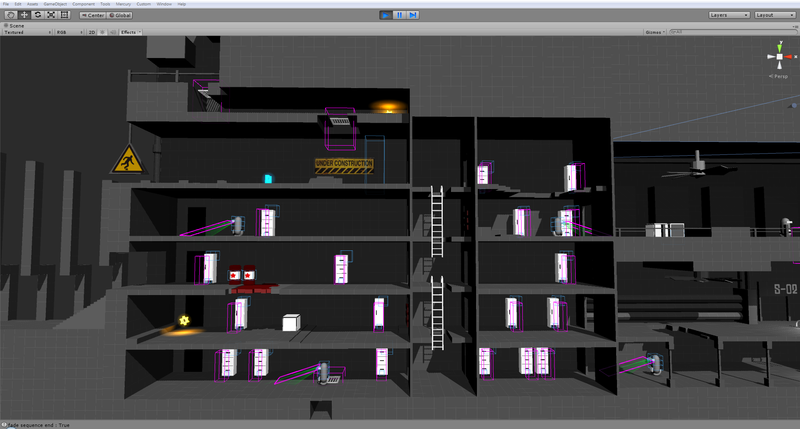 To achieve a high experiential density, most iterations occurred around timing horizontal and vertical traversal distances, puzzles, turret attack rates and placement of interactive elements like levers, grates, and ladders. 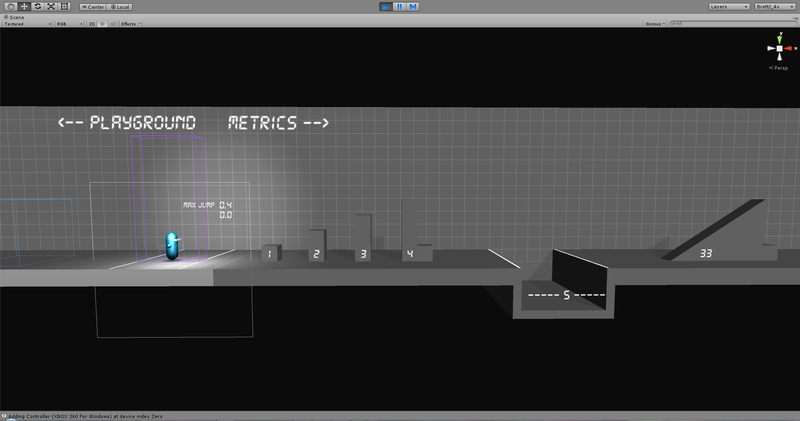 A great deal of time was also spent adjusting the level as refinements were made to the player physics controller. 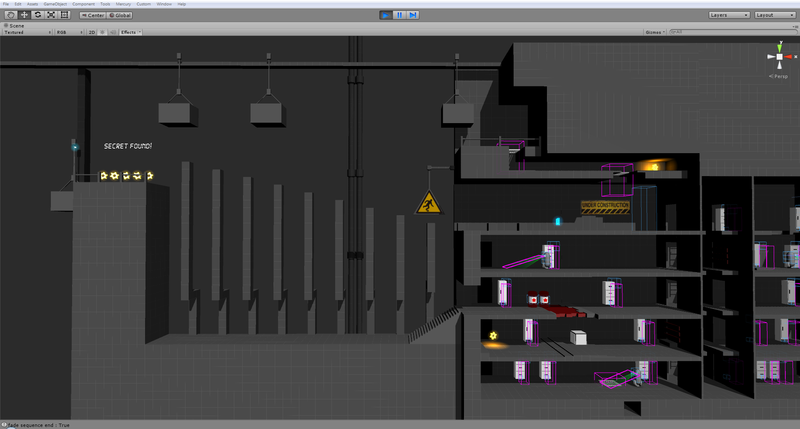 Goal: Design an indoor "factory-like" level with balance of high intensity and exploratory play. Add at least one new weapon and include at least one interactive environmental element used to dispatch enemies. 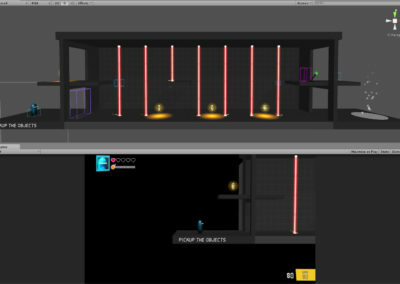 Player must collect resources and work to exit the area alive. Include tutorial elements for new players. Portal on lower far right allows player to quickly travel to and from their "base"
Open area large enough for 1-4 player combat. 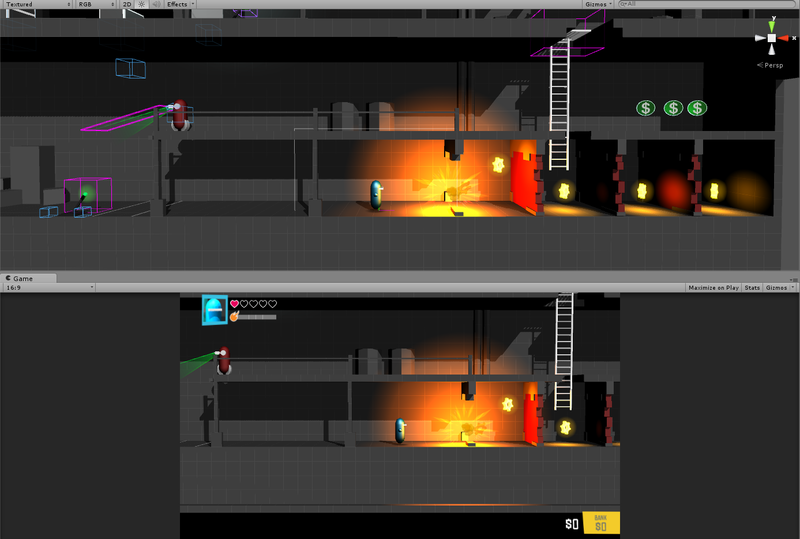 Vertical elements - Items suspended in air and upper right walkway only accessible with rocket shoes or ninja rope. The jumping sequence is meant to look harder than it actually is and is intended to build confidence. If the player constantly moves to the left and roughly taps the jump button in a pattern, they make it 80% of the time. Warehouse_02 became part 2 of a larger experience developed during phase 3. 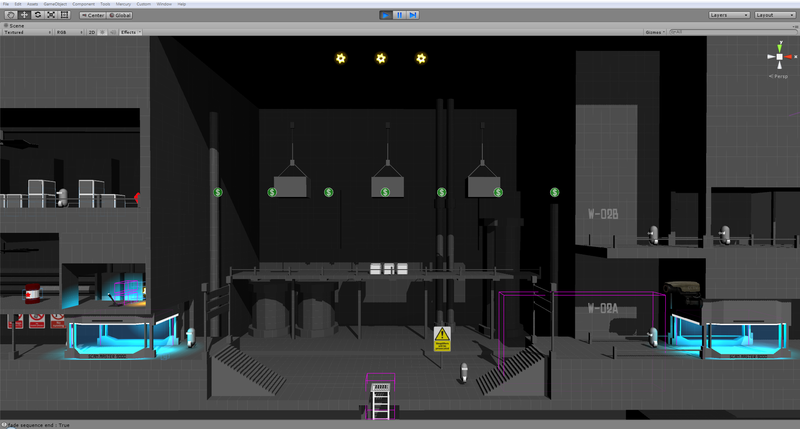 Warehouse_01 connects the Player’s Base to Warehouse_02 and play focuses more on physical puzzles and environmental play. Goal: Design an extended, replayable experience that spans multiple levels, includes an improved FUE, and leverages all current weapons and player items, enemies, and game mechanics. 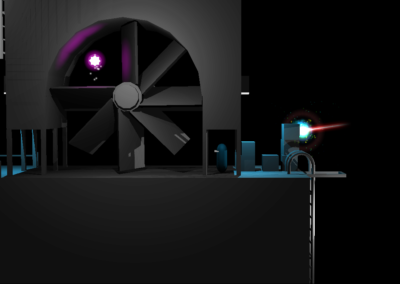 Player must explore the world, defeat enemies, and collect resources to expand their base, create new weapons/items, which enables them to explore further, in a continuous progression of difficulty. 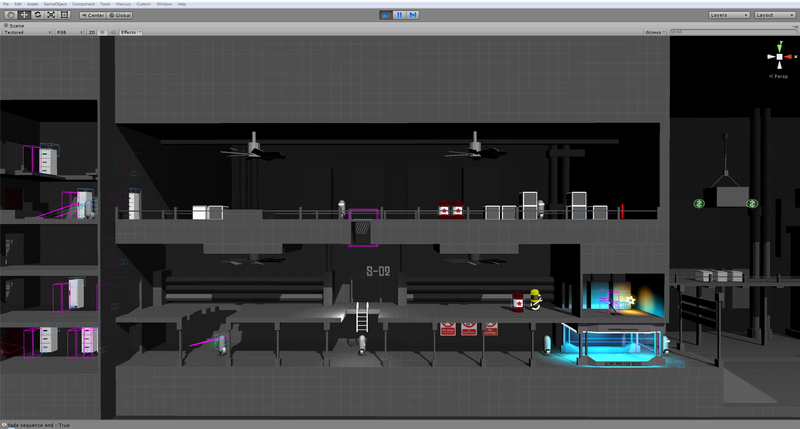 Player’s Base acts as a hub for a set of 4 large, replayable level sections. Simplify threat assessment with an “always aggro” design. If an enemy sees you, they attack. 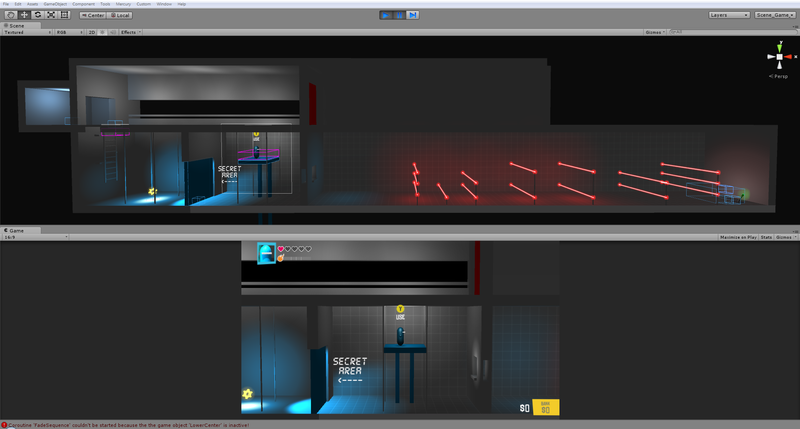 Implement our “disguise” prototype for use with scanners in a segment of the game, instead of as a core element.